70% of the Earth is covered in water, the majority of our bodies consist of it, and next to air and a decent environmental temperature our bodies need it more than anything else. Yet outside of glacial ice, only .2% of the water on Earth is available for humans in rivers, lakes, and watersheds. The kicker is that we treat that water with immense degrees of arrogance, polluting it with chemicals, evaporating it in resevoirs behind huge damns so we can grow melons in the desert and irrigate lawns in Phoenix. I am beginning to hear the lament that our fathers fought wars for land and ideas, we fight wars for oil, and our children will fight wars for water. Water! Enough Doom and Gloom. At our Village Board meeting in July I was stunned when the predominantly Republican board not only accepted, but applauded the presentation on the Natural Step-in fact Johnson Creek is now the 4th Eco Municipality in Wisconsin. How was this possible? Our Board is about as far from a bunch of hippies as you can get-but they are pragmatists to the bone. When we showed them the use of waste heat from incinerators heating whole towns and hydraulic lifts running on linseed oil it rang very true to their farmer spirits. Outside of California, the biggest movement for biodiesel is in the heartland with hundreds of farmers demanding diesel lawnmowers and ATV’s in addition to their tractors and trucks so that they can grow all their own energy. Personally I don’t care if economics was the impetus that pushed them green-it reduces CO2 so I am game. We are building bridges in the Green Movement-with Libertarians railing against Big Business/Government, Christians lamenting the way we are treating the God’s Creation, or the budget conscious buying hybrids and solar water heating systems and growing gardens. There are many roads to sustainability and we need people driving (hybrids) on each one. Water, like green energy and waste reduction can be a bridge builder for the non-environmentalist. I am fond of saying Everyone Breathes, but unless you live in L.A. this is a little too detached for most people to effect behavioral change. If you have to drill an extra 100′ in your new well, have your water use mandated, or even your property damaged in a flood that can make a palpable argument for better water management. Even here in South Central WI, where we have sufficient rain, and comparably good agricultural techniques we are in a water crisis. Last summer in the town next to us a farmer sold off a chunk of land to cover some bills. When the new tenants sunk their well, both the farmer and his neighbor’s wells went dry. When I present my speech on wetland management, rain gardens and barrels to either of those 3 families they will be much more apt to listen than before. This time its personal. My wife and I believe that much of the gulf between the Left and the Right is the degree to which different people are able or willing to empathize with others. As environmental crisis is becoming less theory and more reality, and these anecdotes will become more common. Further removing the empathetic barrier as environmental impacts become more personal. One reason that we are shifting our thinking from running even deeper into rural America to form our Eden, is that we are effecting Real Change here. This town is one small battle in the war to save the planet-when we go from 1200 citizens to 10,000 in the next 7 years our families efforts thru civic involvement, education, and walking the Walk can mitigate the impacts of that growth while. Coincidentally I recently discovered that, Toby Hemenway, one of my Eco-Heroes, had a similar epiphany. If I can get rain barrel or garden on 10% of the houses in my town we could save over 1,000,000 gallons of runoff annually by 2012. (source) Talk about acting locally!! And that is peanuts compared to reducing consumption. Water conservation is easy. 1) Install water conserving appliances like 2-Stage flushing toilets and low flow shower heads. You will not notice the difference anywhere but your pocket book! 2) Put up a Rain Barrel. Buying one can be expensive, building one can be easy if you can find a barrel. Live in Southern WI? I’ll build you a beautiful Oak one for $50 (email somedaygardens@yahoo.com) from a reused whiskey barrel. 3) Plant a Rain Garden. They are beautiful, low maintenance and increase biodiversity-we now have frogs, visits from hummingbirds, and had Monarch Butterflies laying eggs in ours. 4) Use soaker hoses and water lawns early in the day. Massively reduce your evaporation! 5) Landscape sustainably. Use techniques like heavy mulching and Xeriscaping to reduce water needs by 25-100%! Do any 3 of these can easily save 10-20,000 gallons of water a year! Today was a good day. That’s fortunate because it started at about 12:30 am when some serious weather rolled thru and broke my REM. Sprout-our 4 year old, woke up screaming, but we were able to get him down. The next wave of thunderstorms was more severe, so at 2:30am both he and Bird, our 3 yr old daughter, came in for reassurance. We pitched camp on the floor with sleeping bags and Sprout went back down. Bird and I were not so lucky-both tossing and turning for an hour. By then the storms were mellowing, so I figured I might as well be productive. This past week I vowed to get the final 10 pounds of weight off, so I ordered up some really nice shoes and vowed to go running before work. The shoes arrived Monday so I have been getting a mile or two in before work. This being only the third day, my legs were aching (I can’t start slow) but I knew if I skipped one day it would just get easier to skip another so I went out. In the rain. Running a few miles in the rain at a quarter to 4am and witnessing one of the more brilliant lightning displays I can remember was an awesome way to start the day. The thing about running before work is that it puts me in a fantastic mood-I don’t know if its endorphins, satisfaction in doing something I promised myself I would, or just getting an extra half hour to myself to think, but I like it. Alot. Work was typical, which is not a bad thing-I work 4 days a week, each week under 5o hours and make enough to amply support a family of 4 in suburbia. Plus I can wear Patagonia and Merrel’s to work which is very hard to put a price on for me. Does managing a warehouse give my life meaning? No, but it allows me to lead an otherwise meaningful life, free from much take home stress, which is fine and I am hopefully making life more livable for my 25 teammembers. I came home and did my Garden Walk. The gardens were all flush from the lightning and rain, the rain barrels were overflowing, their adjacent rain gardens swollen. The Amaranth had seemingly put on an inch of growth overnight, and another 1/4 bushel of tomatoes were ripe. Is it just wishful thinking, or are the Sunchokes getting ready to bloom? I came inside to be rushed by gushing children and 200lbs of canines with the unconditional love of their kind, and to find Mia organizing the kid’s beautiful clothes for fall (the chitlins are growing like weeds!) With the kids missing nap due to more storms I gave Mia a break while the kids and I picked the gardens clean and made dinner-which was exceedingly pleasant. We have toed the Hard Line with Sprout on his veggies-pretty hard to be a vegetarian toddler if you won’t eat any fruit or veggies… After a stressful week of allowing him to choose from 2-3 fruits or veggies at every meal, with the understanding that he has to eat at leat one type at each meal, he is finally trusting that we Mean Business and the testing is bout over. He even ate some Currant Tomatoes straight from the vine tonight. Yes! Watching the kids sit in the lawn and debate which tomato in the basket was the Druzuba and which was the Amish Paste while I picked peppers was to fulfill a dream I am not sure I even knew I had. After dessert, Sprout and Bird came running up from their chores begging to hear ‘Don’t Know Why’ from Norah Jones. After I put it on they both danced and cavorted around the living room asking to hear it over and over again. Raising two toddlers to love vegetables (Bird will take brocolli over chocolate chp cookies every time), bugs, science, and both Norah Jones and Clutch brings new meaning to being a Father. I don’t think that any prospective Father has any idea what they are in for, but deep down I always dreamed it would be something like this. Here’s a toast to Mia, who makes it all possible. Thanks Hon, you’re awesome. One of my favorite anecdotes in Gaia’s Garden was the Bullock home. In perhaps one of the most inspirational moments of his book, Hemingway chronicles how they revitalized a marsh and enjoyed several seasons of tasty cattail shoots from the wetland until one year a family of muskrats moved in and, being good little rodents, in short order had reproduced and eaten their cattails down to inedible nubbins. Being permaculturists, they chose not to remove the muskrats-more would just move in anyways. Then the next year they had another set of visitors…otters! By the end of the year the otters had moved in to stay and reduced the muskrats to a stable population with the end result that the wetland was now sustainable and they had not only beautiful waterfowl to watch while they ate their cattail shoots, but also muskrats working and otters playing. They had healed the land. Earlier this year our gardens were exploding with vibrant life to our immense satisfaction. Then the locusts descended like a biblical plaque. Ok they were grasshoppers and I am no Pharaoh, but the trauma to our plants was painful and real. Spraying wasn’t an option, so we bought the kids insect catchers to make some lemonade from our lemons. Then the most spectacular thing happened-we got frogs! As Mia has posted, several leopard frogs made our gardens their home and soon after the grasshoppers began to decline. Gaia had rewarded our patience! A few weeks later we began seeing voles as we turned some of our beds. I made some predictions of what the logical conclusion of plentiful frogs, voles, and our new prairie habitat, but never really thought they might come true. This evening after picking a bountiful harvest of veggies (6 varieties of tomatoes and peppers!) I went to stroll down the tree line of our small prairie and something much larger than the usual grasshoppers went rifling through the tall grass. As my eyes tracked up I caught a fleeting glimpse of a beautiful 3′ garter snake. We had done it! Not since I was very young had I seen a snake in suburbia, and now my children will have similar memories. Granted, I had no issues with the frogs and frankly hope they prove hard to catch, but building an ecosystem in our suburban backyard well enough to attract a midlevel predator is something I am proud of. I finally feel I deserve that National Wildlife Federation plaque at the gate to our backyard yard! I have outstanding news to share! This past Monday we had our Monthly Village Board meeting and the Green Committee was able to get some Big Ticket items onto the agenda late in the process in an attempt to ride the energy from last month’s presentation from our County Supervisor and Village Administrator on the Natural Step. First up was for the board to vote if we wanted Johnson Creek to become an Eco-Municipality-and it passed 6:1! The resolution was non-binding and we had intended it to be a statement of intent for now-with the prime focus on education both of the community and the board itself. The next agenda item was huge. Our Green Committee president put for a resolution that all new commercial and government buildings be built to LEED Silver standards, though they will not be required to get certified. Again-this passed 6:1!!! After the votes our village president gave a personal statement about how we have screwed up the environment and if the Big Shots won’t do anything about it, then at least we can start taking matters into our own hands in our own town. I love this! I will have much more to come, but for now: Rejoice! So with the goal of minimizing the amount of lawn to a sustainable level, we have already seen the great amount of choices for simultaneously increasing beauty and utility, while reducing maintenance inputs of both labor and resources (water and fertilizer). The dual benefit of receiving more enjoyment and use from your yard, while also spending less time mowing is a powerful draw. But I also feel strongly that in many cases some lawn is useful-especially with my young children and 3 dogs. 2) Weeds ruin the effect. The fescues do indeed fall over at 4″, but continue growing to 8″ or so. If there is a plantain, non fescue grass, or dandelion in the lawn they will prop the No Mow up to its full 8-12″. That looks like crud and gets me nasty letters from our city. Mowing 8″ grass with a reel mower stinks. So until I get the weeds and quack grass out I will be mowing the back. 3) Reduced watering is different than no watering. We let the back yard go this summer and did not water in July and the grass went dormant like normal. Now in August the grass lower on the hill (slightly wetter) is coming back, but the brown spots on the top third are dead. Oops. 4) It can be mowed, and looks fine when done so. Even with mowing it every other week to keep the quack grass down we are still ahead of the game due to no fertilizer and drastically less water needed. I believe the No Mow is a viable solution with good soil-our is very dense clay with very little organic matter which encourages plantain and dandelion. For now I will continue to overseed no mow as I spot weed, and will mow it a few times a month. My belief is that we will be at a sustainable no-mow in 2-3 years as it gets established, chokes out the weeds, and I get the soil to come back from the dead. How? Read on! 1) It fixes nitrogen!! A lawn with clover in the mix will need 33% less nitrogen annually. Interplant it witha low nitrogen requiring fescue and that jumps to 66% less. 2) It makes mad roots which gives two advantages: it stays green virtually all year, and it break up hardpan. Big Fan. 3) Pretty white flowers all over your yard! Guess what? Your ‘useless’ lawn has just become a 2000 sq ft beneficial insect attractant! Clover flower chains also make wicked cute headbands for the little ones and young at heart. 4) Clover mows well-incredibly easy with a reel mower as the stalks have less cellulose. Plus every time you mow-you fertilize with nitrogen rich clippings! If you are not going pure no mow, I strongly recommend mixing in at least 5-10% white dutch clover in your seed mix. Remember those dead spots I have-I just spread white dutch clover seed into them. These spots are my yard telling me that these areas are really bad-even fescue can’t make it. I am betting clover can, and in the mean time will repair the soil. I could fix the soil myself, but I would need to aerate, fertilize and water like mad-but then I am fighting nature not learning from it. Most Americans will not want to give up the sculpted look of the grass lawn, but pure clover lawns are feasible and beautiful. The Solar Living Institute has a pure clover lawn that has withstood the trials of 10 years of Sol Fest which sees thousands of guests and vendors. Pre WWII and the rise of the suburban lawn, clover lawns were common for their beauty and ease of maintenace. Remember that whether you are overseeding clover or going 100% clover lawn you will want to inoculate the clover seed to ensure that you get all the nitrogen benefits you can. Innoculant is available at any farm supply store, and should be available where you buy your seeds. Application is as wasy as putting cream in your morning coffee. To recap, the single most ecological thing you can do with your lawn is to reduce its size as much as possible. An established bluegrass lawn has about the same percolation as concrete-greatly increasing runoff. Perennial beds have much higher perc factors letting rain replenish aquifers instead of contributing to flash floods and the other nasties of non point source pollution. But water infiltration is just the tip of the iceberg. I have counted at least 9 monarch caterpillars in our prairie gardens, we have golfinches feeding almost constantly on either our cupplant, coneflowers or sunflowers, and doves drinking for days from our rain gardens. By planting vegetable and fruit gardens you can make a real difference by cutting down the amount of petroleum in your food. Tonight in my former lawn, I gathered 4 of the ingredients for our dinner tonight, and I had enough basil and tomatoes that we were able to run some over to the neighbor’s. Trips like these have helped convince them to put gardens in next year. Got one! Building an outdoor room where you once had lawn will better connect you with the wonders of nature-goldfinches are now my preferred dinner music. Finally I would be remiss if I did not mention the great selection of organic lawn fertilizers out there-we buy a pelletized fertilizer for under $10 a bag and have no problem keeping up with neighbors on the Scotts Program. Don’t be scared off by the low N-P-K numbers-the Scotts stuff is only around until the first good rain, and then it is off causing algae blooms in your local creek, where the organic fertilizer is a slow release fertilizer that is feeding the soil to allow it to better feed the plants. More nitrogren just gluts your plants, increasing the likelihood of pests, and burns off the carbon in the soil locking you into a viscous cycle of chemical inputs. When you do water your lawn do so in the cool of the morning or evening on a still day-most of the water applied in the hot afternoon sun evaporates. I have chosen to ensure that my lawn uses as few resources as possible-no gas, little water, and no petro chemical fertilizer. I am also well on the way to turning my lawn into a small scale market garden. 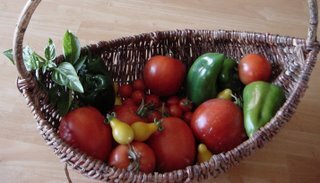 When I list off the varieties and quantities of vegetables, fruits, and yes even grains, that I have growing in my yard people can’t believe I am doing it on a 1/2 acre suburban lot. This can be done, I am even doing it all within the guidelines of an homeowners association and there are thousands more like me out there. In fact whenever someone finds out where we live-they always comment on the gardens-function can be beautiful! Running with abandon down the slight hill in our backyard with my 4 year old is easily worth half hour of mowing a week-but the amount of lawn it takes for that is about as much as I need for about the most space intensive outdoor activity I can think of-setting up a volleyball net for a summer party. And that is about as much lawn in the back as I would like to get to. If you too are finding that you would like to reduce your lawn while increasing the enjoyment from your yard, there are several options-most of them easy, some of them cheap, and all of them beautiful. No I am not off my rocker. Okay maybe a growing amount of people think so, but orchards are suprisingly easy. Intimidated by Apples and Peaches? Then try small fruit! Raspberries and blackberries are so easy to grow that some cultures treat them as weeds. They are crazy cheap and need very little care other than some pruning each year. And don’t let the pruning scare you! Raspberries pruning is child’s play-at the end of the season if the cane is brown and barky its done fruiting so hack it off and compost it. Boom-you’re done pruning. Still too hard? Get an everbearing variety and cut all the canes down each fall. Simple as pie… really, really, good raspberry pie! And why are you afraid of Apples and Peaches? First read: The Backyard Orchardist to become an instant expert and then get going. Plant a dwarf variety and you don’t need a ladder to pick them, infact in an area about 20′ by 30′ you can grow at least 2 trees each of Apples, Peaches, Pears, and Olives (look for a future post as I try just that!) here in zone 4/5. 600 sq ft of lawn gone and even more food for your family! My orchard will be two rows of trees with strawberries as a groundcover and a meandering clover patch down the middle and sides for access, nitrogen fixing, and beneficial insect attraction. Last year I planted 125 strawberries. That sounds like a lot-and it is. In fact everyone thought I was loco, but eating a quart of fresh, incredibly sweet strawberries every day in June was perhaps as close to culinary heaven as I can get. Even though they are not very local or small farm-I use Nourse Farms for all my small fruit. They are crazy cheap, offer heirlooms, have good quality and, well, they’re crazy cheap. If you can find local fruit plants buy them! We have 3 island beds and our house is literally surrounded by 4′ to 6′ of perennial beds. Of all the de-lawning we have done this has had the biggest impact in sq footage: over 2000 sq ft so far. By choosing hardy, drought tolerant plants (Mediterranean varieties do well both wet and dry as do natives) will cut your watering bill immensely. A trip to the library will help immensely with planting ideas to stretch the bloom across the summer, or get the Prairie Nursery’s Catalog for some great garden ideas. Putting in perennial beds can be expensive- there is no doubt. We went in big the first year, and are adding about 500 sq feet each year with splits and a few extras from the nursery that catch our eye. Local garden clubs often have plant swaps, or even better ring the bell of that beautiful house on the corner whose flowers you have always admired. For the price of some conversation you will almost certainly leave with more splits than you can carry, and will have made a human connection in your neighborhood. Gardeners love to talk shop! As perennial beds are often plant once deals, do the soil prep and weed prevention right-incorporate lots of oganic matter and compost, and lay some weed barrier (newspaper works great) and then mulch the dickens out of it: at least 4″, 6 would be better. Your village Public Works or utlity will almost certainly have a pile of free wood chips if you give them a call. If you want/need something more decorative put the free chips down 4″ deep and top dress with the ‘pretty’ stuff. Personally the free stuff looks fine to me. The added benefit of surrounding your lawn with gardens is that you can sculpt the perimeter to round off all sharp corners-drastically reducing mowing time. Perennial beds also don’t have to be all flowers-edilbe landscaping works. We have several fruit bearing shrubs in our gardens, and sunchokes are beautiful sunflowers in late summer, and a tasty potato substitute after first frost. You don’t have to mow a deck! To be eco-riffic find some sustainably harvested cedar or redwood for the deck, or if you are going for a patio use a permeable stone patio instead of a concrete slab. Not only does this drastically reduce water runoff, but you can also get very creative with the seams-plant some thyme in the sand between the stones to add some fragrance to your evenings. Also, you can go 3-D and raise an arbor over your patio-not only does this keep the sun off, but it also happens to be a great place to grow clematis, grapes or kiwi to not only keep you cool and shaded, but from getting hungry as well! Figure at least another 250 sq ft gone. There are numerous other ways to reduce your amount of lawn. We have planted a raingarden under every downspout (about 400 sq ft each), installed 100′ of wood chip paths along walkways that wouldn’t grow much grass anyhow, and we have even converted the back 10′ of our yard to a prairie plantation that is home to several monarch caterpillars. Adding beauty and flavor, and utility to your yard is a fantastic way to reduce the drab, resource and time intensive American lawn, but having a right sized place to play with the family or dog is important too. Looking out my window today, across out our front perennial beds, I was again struck by the sheer volume of lawn in my subdivision. So I will be embarking on a brief series of posts about yards, their costs, and the beautiful solutions to the ‘traditional’ American lawn. 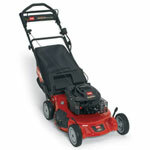 First in the crosshairs will be the ubiquitous gas lawn mower. In an article this spring the NYtimes posted these stats: “ Gallon for gallon — or, given the size of lawnmower tanks, quart for quart — the 2006 lawn mower engines contribute 93 times more smog-forming emissions than 2006 cars, according to the California Air Resources Board. In California, lawn mowers provided more than 2 percent of the smog-forming pollution from all engines.” Putting that in perspective the typical lawnmower uses a 1/2 to one gallon a month, it is contributing about as much as the homeowner’s car in the same period. Even with my bias that number staggered me a little. The kicker is that the solution is simple-add a catalytic converter. We aren’t talking the big $200 ones on your car-these are cute little buggers that will only cost about $30 to add on at the factory. If you asked the average American if paying an extra $30 for a measurable (2%) improvement in air quality the vast majority would agree. What gets my goat is that Briggs and Stratton is fighting this tooth and nail. Why? If the EPA mandates it all mowers will need the converters so the playing field will be as level as it is today. Lobbyists are killing our country. Right now you can’t go buy a converter to add to your mower, so how do you keep you lawn snazzy and your air clean? When we lived in our last house we had a small .1 acre yard that I mowed with a reel mower (great info @ clean air gardening), and when we moved out to our larger .5 acre yard I vowed to keep that little mower. If you keep the lawn short, it mows very well with less effort than horsing around an 80lb gas mower. It’s safer-I typically mow while our two small children play very nearby. It’s quiet-I can mow at 6am on a Sunday, or watch finches at the feeder oblivious to mpresciencece. In fact I find the soft whoosh-whoosh of the spinning blades very soothing-can’t say a Toro ever did that! It’s dang cheap-we paid under $100 for our Craftsman and the only maintenance is a sharpening (takes 20 minutes and if you can turn a crank clockwise you’re qualified) once every 2-3 years. Downside? Taller weeds don’t get cut, and the lawn needs to be kept under 2″ tall-shorter than is healthy for an organic lawn. Reel mower not tripping your trigger? Try a rechargeable one from Black and Decker-if seen them at Menardies for $350, or get one with a cord for half that. Still whisper quiet and low maintenance-though they cost 2-4 times as much and have some safety concerns around the kiddies. Unless you are off grid they are using energy for lawn maintenance, but it is a fraction of a gas mower and you can grow the grass longer reducing your watering and weeding. But if you are considering the electric route because the Reel Mower will take too long, the answer is beautifully simple, and simply beautiful-reduce the lawn area with other plantings or even (gasp!) the need to mow at all.